Netflix’s original series: It’s beating HBO without being better than HBO. Its shows aren’t as good as HBO’s, but there’s more to business than quality. Kevin Spacey stars as Frank Underwood in Netflix’s House of Cards, which is only so good but sure does generate buzz. 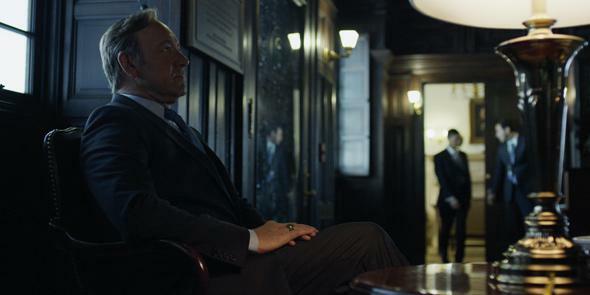 Like most people residing in the nation’s capital, I spent a healthy chunk of my weekend binge-watching House of Cards. In my case, I binged all the way from the beginning since I inexplicably missed the first season. The first thing that struck me, apart from how much I kept wanting to move on to the next episode, is that, as Slate’s Willa Paskin has written, it’s not really a very good show. Despite the superficial indicators of prestige television—David Fincher! Kevin Spacey! Ominous camera angles!—the actual product is no The Wire or The Sopranos. The show tells us nothing about the human condition. It is an interesting vehicle for exploring how the American political system works, but only insofar as explaining why its outlandish scenarios couldn’t possibly unfold in real life is a useful exercise. And yet, I keep watching. And there’s a lesson in that. Netflix Chief Content Officer Ted Sarandos famously described his company’s challenge as “to become HBO before HBO becomes us.” And so far he’s winning—not just because Sarandos and Netflix CEO Reed Hastings are smart, and certainly not because HBO’s leadership is stupid. Netflix is winning because the structural nature of technological change often favors new firms over old ones, and turns inbuilt structural advantages into weaknesses. Netflix is, to use a word that’s become annoyingly overused, “disruptive.” Which is to say that, relative to its pay-television competitors, Netflix has certain advantages that supersede the quality of its programming. And its competitors are in important ways trapped in a business logic that prevents them from matching what Netflix is good at. Most notably, Netflix is dramatically cheaper than HBO. New HBO subscribers can typically get a discount from their cable company, but the basic price of the premium channel is $15–$20 a month—more than twice the price of Netflix. Except it’s worse than that, because HBO is an add-on to a basic cable television package. Due to the paucity of competition in the market, going broadband-only and skipping a cable subscription saves you surprisingly little money (I know from personal experience), but it’s not nothing. More to the point, HBO’s ties to a cable subscription don’t just increase costs—they decrease flexibility. When I was in college, the dorms were wired to give students free broadband, but you couldn’t get cable at any price. Those kind of environments are edge cases rather than the mainstream, but they highlight Netflix’s ability to serve a wider range of customer needs. Even though many of us would buy a standalone, broadband-only version of the HBO Go app, HBO has good reasons for not offering this. HBO’s existing business is a really good business. Its $4.9 billion in revenue last year was only slightly higher than Netflix’s $4.37 billion, but in terms of operating income, HBO blows Netflix out of the water: $1.7 billion to $228 million. With those fat, cable-derived profits on the line, HBO can’t afford to just worry about losing customers to competitors. If it launched a cord-cutting product, it would have to worry about losing customers to itself—replacing its current, high-margin customers with lower, Netflix-style margins. Customers’ main reaction to HBO Go’s unavailability as a standalone product has been to do things like borrow an account password from parents or friends who do subscribe. HBO, fairly sensibly, has not tried to crack down on this; CEO Richard Plepler says he doesn’t really mind if it happens. Vigorous enforcement of a “one household per HBO Go account” rule would inevitably annoy legitimate customers while doing relatively little to gin up new subscriptions. Still, legitimizing misuse of your own product is not an incredibly promising long-term strategy. By holding to the idea that a single account should be for a single household despite a lack of practical enforcement, Netflix has been able to introduce practical features that are useful to real households. My wife and I have separate Netflix personas that track our viewing habits and preferences separately, allowing for the collection of more fine-grained user data and appropriate recommendations. HBO is not only behind the curve in terms of analytics—its entire broadband streaming strategy is at odds with gathering those analytics properly in the first place. Last and by no means least, there’s the binge-watching. Releasing a whole big batch of episodes all at once is clearly a smart business strategy. Encouraging a show’s biggest fans to gorge on episodes builds more buzz and sets off the kind of social cascades that make hits more likely. In other words, all the people binging on Season 2 of House of Cards—and talking about their binging—inspired me to finally go back and start binging on Season 1. It also helps to disable critical thinking about how compelling the content really is. But just as a standalone HBO Go product is incompatible with a high-margin partnership with cable companies, a binge-releasing strategy is incompatible with being a good citizen of the larger television industry. HBO is part of the much larger Time Warner, a company that includes conventional television networks and production companies. It’s not in the interests of those partners to revolutionize the pacing of television production and distribution, so the pressure on HBO to lag the trend will be intense. By contrast, HBO’s innovations—like making its entire library available on demand—are easy for Netflix to copy. What Netflix doesn’t yet have is the depth of experience in creating really great shows. But in business, there is more to life than quality. Cost, convenience, and flexibility matter, and Netflix wins on all of those. Meanwhile, quality is in some ways the easiest dimension on which to improve. To an extent, firms learn by doing. House of Cards is much better than Lilyhammer, and Orange Is the New Black is better still. Actually getting better still takes hard work, of course, but there are no vested interests or business-model factors preventing Netflix from taking on that challenge. What Netflix does well, HBO can’t always afford to copy without risking its existing franchise. What HBO does well, Netflix can try to copy. And it’s getting better all the time.